Luber, who has researched subjects including heat stress in urban environments and harmful algal blooms, climate change will “increase the potential for the transmission of disease” as well as directly affect human health through an increase in severe weather events, including heat waves. Luber is an epidemiologist and the chief of the Climate and Health Program in the Division of Environmental Hazards and Health Effects at the National Center for Environmental Health, Centers for Disease Control and Prevention. He has also served as an Epidemic Intelligence Service officer and staff epidemiologist at CDC. 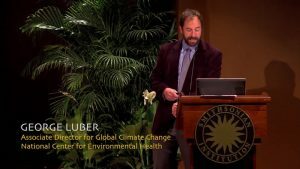 Additionally, Luber is a co-chair of the Climate Change and Human Health Interagency Workgroup at the US Global Research Program and a member of the American Anthropological Association’s Presidential Task Force on Climate Change. He is also a convening lead author and member of the Federal Advisory Committee for the US National Climate Assessment and a lead author for the Intergovernmental Panel on Climate Change (IPCC), Fifth Assessment Report. The Climate 25 is a digital media and television experience featuring interviews with the world’s 25 most compelling voices on one of the most pressing issues of our time – the impact of climate disruption on human security. Follow this link or click the image below to view CDC scientist George Luber highlight some of the physical and mental ailments already affecting people due to climate shifts, and offer some possible ways to re-shape communities to be more resilient and adaptable. The Pull Together Now (PTN) Alliance is a transboundary organization which cultivates unity and shared responsibility for the common good of all peoples and Mother Nature. Visit the PTN site for more workshop videos about the indigenous views of nature.